Áine Ní Chonaill spoke about "so-called students". A LABOUR TD was forced to withdraw comments she made today comparing statements from the Immigration Control Platform (ICP) to what happened at Auschwitz. Anne Ferris TD made the comments in response to the ICP’s Áine Ní Chonaill who told an Oireachtas committee that illegal immigrants “are giving two fingers to the State”. 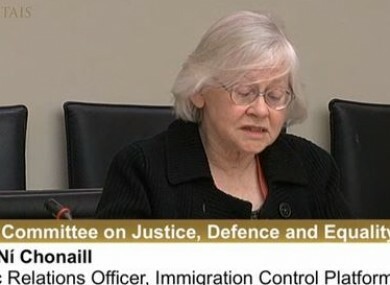 The Oireachtas Committee on Justice, Defence and Equality was meeting to follow up on a hearing from the Migrant Rights Centre Ireland last month. After Ní Chonaill’s opening statement, which claimed that politicians had “not woken up” to the issue of illegal immigration, Ferris compared Ní Chonaill’s views to Nazism. “This day two weeks ago I visited Auschwitz and there is a common thread between reading this statement and what I heard in Auschwitz,” she claimed. “That is outrageous,” responded Ní Chonaill, as Fine Gael committee chairman David Stanton requested that Ferris withdraw the remark. A few moments later, and after further shouted requests from Ní Chonaill that the comments be withdrawn, Ferris agreed to do so. “I regretfully withdraw it because you asked me to do so,” she said to Stanton. Ní Chonaill had earlier described illegal immigration as “the modern form of invasion”, arguing that it is the job of the State to safeguard its borders. “But it is no less of invasion when it is the more clandestine form of illegal immigration that is experienced in Ireland,” she added. It may be so-called students whose intention was to abuse the system to gain access to labour market. It may be people issued with deportation orders who went on the run and many other categories. In all cases it is effectively people who are giving two fingers to the State and are saying, ‘no you don’t device who comes to the country and what limits there will be’. Anne Ferris TD who withdrew her Auschwitz remarks. Sinn Féin’s Padraig MacLochlainn questioned Ní Chonaill’s views but added that people must be aware that the views of the Immigration Control Platform are not “on the fringes” of Irish society. “I think its important to be honest, if you were to follow the report of this debate later on TheJournal.ie, the majority of the comments would support our two speakers. Let’s be honest about that, ” he said. Independent TD Finian McGrath disagreed that the majority of comments on TheJournal.ie would support the views of the ICP. “I personally don’t agree with that assessment, I think there would be about 15% of people who would agree with your assessment, in my view,” he said. The ICP’s Ted Neville and Ní Chonaill were both asked whether illegal Irish immigrants in other countries should also be deported back to Ireland. They repeatedly answered that the ICP is a “single issue” organisation and is not concerned with Irish citizens abroad. Email “Oireachtas told: 'Illegal immigrants are giving two fingers to the State'”. Feedback on “Oireachtas told: 'Illegal immigrants are giving two fingers to the State'”.